Well the show is over and done. 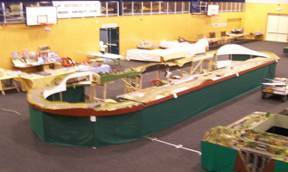 It was a great opportunity, for those involved in building up to, setting up and displaying at the show. Thanks again to all those who assisted during the show, either setting up, operating or packing our display away. A special thanks goes to Allan, for the use of his truck. His DCC. And a major collection of his rolling stock. Thanks also to Grant MacMillan and Neville McKay for their input at the �shed�, and to Tony Corkill for his electronics skills. Thanks to the skills of Jeremy Jones, you can all see what the trackgang is up too at www.boptrackgang.co.nz . If you wish to sign in as a member to the web page, you can view statistics on site hits. Look forward to your feedback and ideas on continued input into our site. Is there anyone who wishes not to be named or have there details used on the site, please let me know. 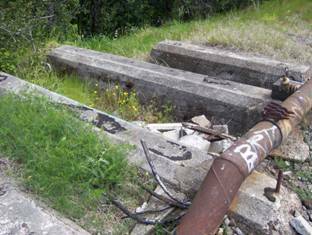 During a recent walk around, I was at the old Tauranga railway yard, and found the old concrete base for the water towers, which included the loop upstand pipe, still existing. Not bad considering steam locomotives haven�t run regularly for over 40 years. Meanwhile its back to the shed, to continue work on the modules in preparation for our next display. At this stage we aren�t doing the Tauranga show on the 6 January 2008.